Project directors, Dr. Lori Peek and Dr. David Abramson discuss the project development process for the inaugural year, 2013-2014. THE SHOREline VISION: To develop a network of youth who help themselves, their families, their schools, their communities, and youth in other communities recover from disaster. THE MISSION: (1) To establish and sustain a network of disaster-affected youth who build powerful connections with other youth and with adult leaders and innovators; (2) To develop skills, foster hope, and capitalize on opportunities to help disaster-affected youth and their communities recover from the loss and disruption caused by extreme events such as hurricanes, floods, tornadoes, and oil spills. First, the children and youth of the Gulf Coast have been exposed to more disasters over the past decade than any other group of young people in the United States. Second, that exposure to multiple disasters and other chronic stressors has led to an accumulation of mental and physical health issues and educational and social challenges. Third, although they are among the most affected in disasters, children and youth are often excluded from the decisions and actions that can influence their health and recovery. LEARN what it takes for youth and their communities to recover from a disaster. 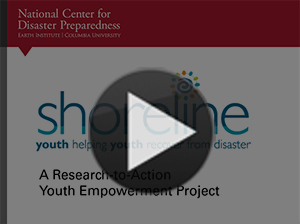 BUILD the tools and resources to help other youth and communities recover from a disaster. Serving as a voice for disaster-affected youth through creating a space for youth advocacy. Students who are selected to participate in this exciting project will have the opportunity to acquire a broad range of skills and experiences.